If you just love your morning cup of French press coffee, then this is something you will definitely like. 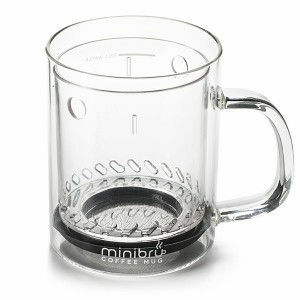 Guys at ThinkGeek invented this awesome kitchen cup called the minibru. Making coffee with this cup is so easy. You just have to fill the cup with coarsely ground coffee to the lower fill line and then pout in the hot water to the upper fill line. Allow two or three minutes for the brew to steep. After few minutes, insert the filter cylinder and press down slowly until your brew is completely filtered. And your freshly brewed cup of coffee is ready for you to enjoy it! You don’t have to bother much with cleaning up your cup – plunger and gasket are hand wash only and the rest of the cup is made from glass, so you can simply put it in a dishwasher. You can buy it from ThinkGeek for $17.49.